Sorry! 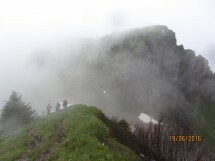 Hiking is moved to Saturday 30 July, due to more favorable weather on Saturday. 60 km from Geneva, joining St-Jean-d'Aulps and from Mont d'Evian. Through a forest, then on a forest road to the chalets of Brion, a magnificent site. The almost horizontal track dominates the Aulps valley and arrive at the Col de Tavaneuse. Those who wish can climb a debonair peak by the Roc de Tavaneuse, 160 m above: a highly panoramic summit. In this case, return by the passage of Savolaire and Brion, in a preserved area and still relatively wild mountains of Chablais. A gradient of 1000 m and a distance of 14 km. Walking time: about 5 hours.